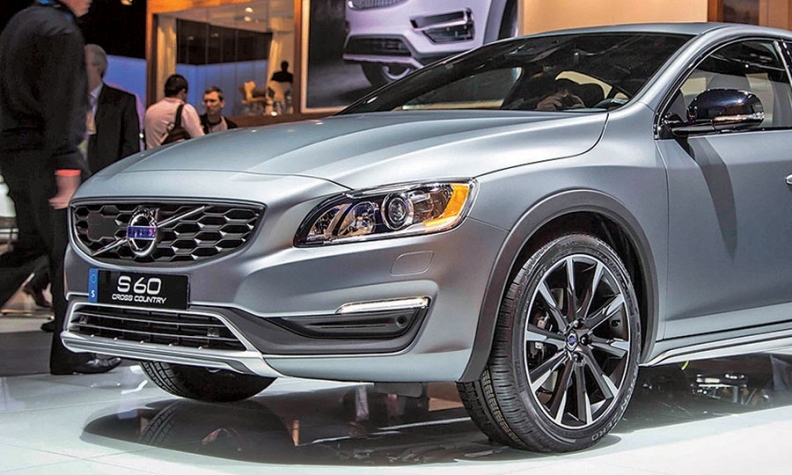 The 2016 Volvo S60 Cross Country variant goes on sale this month. It will compete in a niche that blends sedan and crossover attributes. Volvo is revamping its product range with an all-new scalable platform and design and new four-cylinder family of engines. And it will start building cars in the United States in a new South Carolina factory in late 2018. The Swedish brand said it will have seven new or redesigned vehicles by the end of 2017. The XC90 crossover that went on sale this spring was the first. Volvo wants to be perceived as a true luxury player on the same field as Mercedes-Benz, BMW and Audi. Volvo executives admit that the brand has been conceived as near luxury. Volvo's Scalable Product Architecture will be used next on the replacements for the S80 and XC70. S40, XC40, V40: Volvo's smallest car sold in the U.S. was the S40 sedan. It was discontinued here in 2011. Volvo continued to sell it as a hatchback in Europe. The redesigned S40 and a new XC40 crossover will be built on its new Compact Modular Architecture that Volvo is jointly developing with Chinese owner Zhejiang Geely. Executives have hinted that some of the new compacts will be sold here, without giving specifics. The XC40 is expected in 2018 in Europe, but there's no timetable for the U.S. market. The S40 sedan or hatchback -- the design hasn't been revealed -- will follow in 2018. 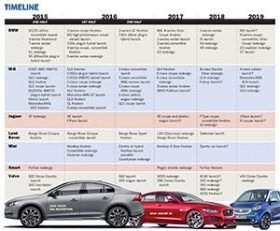 According to a Dutch newspaper, Volvo executive Alain Visser recently confirmed that the next-generation V40 will be available in the U.S.
Click here to view a PDF timeline of European future products. V60: The V60 wagon, one of Volvo's newer cars in the U.S., will be redesigned in 2018. The taller Cross Country variant will be redesigned in 2018 or 2019. S60: The S60's own tall Cross Country variant goes on sale this month and will compete with the BMW 5-series Gran Turismo in a niche that blends sedan and crossover attributes. The Cross Country's ride height has been increased by 2.5 inches and all-wheel drive has been added. It uses Volvo's T5 2.5-liter inline five-cylinder engine with 250 hp and costs nearly $10,000 more than the entry S60 sedan. Built in China, the S60 Inscription is a long-wheelbase version of the sedan with 2.9 inches of additional legroom -- making the car competitive with the larger, revamped Mercedes-Benz C-class sedan. The Inscription is now arriving at dealerships. A redesigned version of the S60 compact sedan is expected in 2018. XC60: The redesigned compact crossover is expected in 2017 or early 2018. XC90: The redesigned crossover went on sale this year featuring new styling, safety technologies, more fuel-efficient engines and a more premium interior than its predecessor. It may be freshened in 2018. S90: Volvo's flagship sedan will be renamed the S90 when it goes on sale in late 2016. It replaces the S80, the oldest car in Volvo's lineup. The S90 will be filled with infotainment and connectivity features as well as upgraded trim to compete with the large German sedans. Styling will be modernized, taking cues from the Concept Coupe. There may be a coupe derivative called the C90. A station wagon is possible, based on the Concept Estate that debuted in 2014 in Geneva. V90: The full-size wagon will also debut by the end of 2016. A Cross Country version to replace the XC70 is expected in 2017.